A typedef that is needed to ensure that the PseudoJet::structure_of() template function works. undo the last iteration j -> j_1,j_2 (with pt_1>pt_2) until the two subjets satisfy pt_1 > delta_p pt_J (with pt_J the pt of the original jet) and |y_1 - y_2| + |phi_1 - phi_2| > delta_r. at this stage, one has at most 4 subjets. If one has less than 3, the tagger has failed. impose that the W helicity angle be less than a threshold cos_theta_W_max. The W itself has two pieces (corresponding to W1, W2). 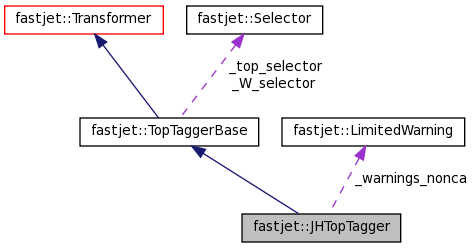 The existence of the first two of the structural calls (W(), non_W()) and the fact that the top is made of two pieces (W, non_W) are features that should be common to all taggers derived from TopTaggerBase. See also 13 - boosted top tagging for a full usage example. Definition at line 120 of file JHTopTagger.hh. Definition at line 134 of file JHTopTagger.hh. 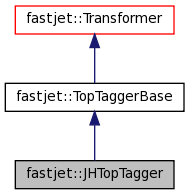 runs the tagger on the given jet and returns the tagged PseudoJet if successful, or a PseudoJet==0 otherwise (standard access is through operator()). Definition at line 62 of file JHTopTagger.cc.